Maryland says Frederick County's signs are not compliant with state regulations, but County Commissioners President Blaine Young believes politics is playing a role in the rejection. 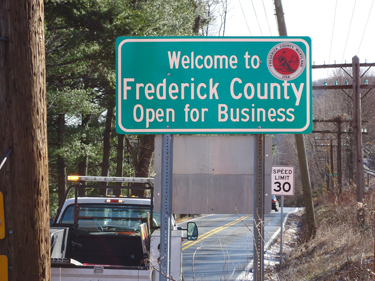 WASHINGTON – Frederick County wants to make visitors feel right at home with welcome signs highlighting some of its best aspects, but Maryland is blocking efforts to put the signs on state highways. Board of County Commissioners President Blaine Young said he believes politics is to blame for the state’s rejection. “The state feels that government creates jobs. We feel that businesses create jobs and that’s why they reject putting our signs on state-operated highways,” he said. “If the State of Virginia can have ‘open for business’ on their welcome signs, what’s the big deal about putting this on our welcome signs?” Young said. “They [Maryland State Highway Administration] said they [the signs] weren’t compliant, and the only thing they think is not compliant is our philosopher,” Young said. The Maryland State Highway Administration disagrees. “This has nothing to do with that type of an argument,” said Charlie Gischlar, spokesperson for the agency. “This is something that has strictly to do with the manual, uniform traffic control devices,” Gischlar said. Gisler said the state is willing to work with the county on developing alternatives.